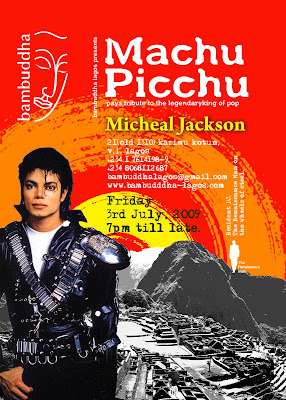 Back by popular demand, Machu Picchu – the premier night on the Lagos social calendar is back for its July instalment. This is a particularly special edition as it is dedicated to the King of Pop who we lost last week. So..come and help celebrate the legacy that is Michael Jackson with our usual twist of colour, culture and people; this Friday 3rd July, 2009 at 7pm. Come dressed as your favourite Michael – the black or white or gloved one - we’ll welcome you the same.